Definition at line 75 of file MipsInstPrinter.h. Definition at line 77 of file MipsInstPrinter.h. References getRegisterName(), MI, llvm::RISCVFenceField::O, printMemOperand(), and printOperand(). 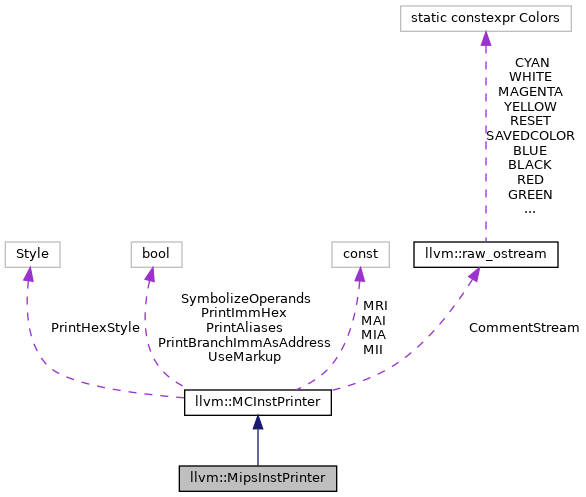 Referenced by llvm::MipsTargetAsmStreamer::emitDirectiveCpLoad(), llvm::MipsTargetAsmStreamer::emitDirectiveCpsetup(), llvm::MipsTargetAsmStreamer::emitFrame(), llvm::MipsAsmPrinter::PrintAsmMemoryOperand(), llvm::MipsAsmPrinter::PrintAsmOperand(), llvm::MipsAsmPrinter::printOperand(), and printRegName(). Definition at line 78 of file MipsInstPrinter.cpp. References assert(), llvm::tgtok::Bits, llvm::MCInstPrinter::formatImm(), llvm::MCOperand::getExpr(), llvm::MCOperand::getImm(), llvm::MCInst::getNumOperands(), llvm::MCInst::getOpcode(), llvm::MCInst::getOperand(), llvm::MCOperand::getReg(), llvm::MCOperand::isExpr(), llvm::MCOperand::isImm(), llvm::MCOperand::isReg(), llvm_unreachable, llvm::MCInstPrinter::MAI, MI, llvm::Mips::MipsFCCToString(), llvm::RISCVFenceField::O, OR, llvm::MCExpr::print(), printAliasInstr(), llvm::MCInstPrinter::printAnnotation(), printInstruction(), and printRegName(). Definition at line 74 of file MipsInstPrinter.cpp.